A black and white photograph of Governor General Roland Michener arriving at Oshawa's City Hall. Governor General Roland Michener (April 19, 1900–August 6, 1991) came to Oshawa on September 18, 1968 to present the Companion of the Order of Canada to 97 year old philanthropist Colonel R.S. McLaughlin (September 8, 1871– January 6, 1972) at a civic luncheon held at the Genosha Hotel. Before his luncheon the Governor General spoke to a crowd of school children at the Memorial Park bandshell on Simcoe Street South in Oshawa. Michener, The Right Honourable Roland ; Winter, Brian ; McLaughlin, Colonel R.S. 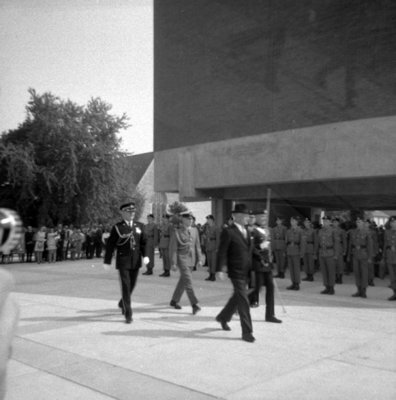 Visit of Governor General Roland Michener, September 18, 1968, Brian Winter. Whitby Archives A2013_004_249.